I love all kinds of cookbooks. I love technical ones with very specific ingredient lists and complicated, precise instructions. I also love ones that are straightforward and give you the simplest path to creating dishes. And, lately I’ve found I really love cookbooks that tell you how the author really cooks at home. That glimpse into how cooking decisions are made differently from one day to the next and how recipes get changed depending on the season or what’s in the refrigerator gives you options and ideas for your approach to each dish. The latest from Dorie Greenspan, Everyday Dorie: The Way I Cook , is in this category, and I received a review copy. Throughout the book, the head notes tell you how the recipe idea originated, various versions that she’s made over the years, and ideas for substitutions or tweaks. The chapters cover starters through dessert as well as basics. I got a little distracted in the Soup chapter and wanted to make everything. There’s a Potato Chowder Lots of Ways that offers several great options for every time of year. Then, there’s Clam Chowder My Way that’s made with lemongrass, ginger, and coconut milk. I also want to try the Morrocan-Spiced Chickpea and Noodle Soup and the Bean and Tortilla Soup. The Chicken chapter has Sweet Chili Chicken Thighs, Chicken-Chili Tamale Pie, and Roast Chicken with Pan-Sauce Vinaigrette among others. The Sweet and Smoky Carrots look delicious and are made with a spice syrup that combines cider vinegar, smoked paprika, cumin, and cayenne. And, there are suggestions for more ways to use this syrup like mixed into mayonnaise for slaw or as a vinaigrette with kale or arugula. Of course, all the desserts look amazing, and I keep stopping to look again at the Tangerine-Topped Cheesecake. But, don’t stop reading there. Do read all the way through the Basics and Transformers chapter. There’s a Chocolate Crunch recipe in that last chapter that’s suggested as a topping for the Dark Chocolate Pudding dessert. This would also be fantastic as a crumble topping on lots of other things, and why had I never thought to make a chocolate crumb topping when crumb toppings are on my list of favorite things? To start cooking from this book, I tried the Salmon Burgers because adding yogurt to keep the mixture from becoming dry sounded like such a good idea. I made the burgers as minis and thought they would be great as party food. Skinless salmon was pulsed in the food processor while yogurt, minced green onion, parsley and cilantro in my case, Dijon mustard, grainy mustard, and capers were mixed to combine. Lemon zest was grated into the mixture before stirring in the salmon and seasoning with salt. I also squeezed in some lemon juice. The mixture was refrigerated for a bit before proceeding. Then, I made it into mini burgers that were cooked in oil in a skillet. They only need a couple of minutes on each side. I served them on little, toasted challah buns with arugula and avocado. I had some Meyer lemons on hand and remembered a lemon salsa from the The AOC Cookbook by Suzanne Goin and used that as an additional topping. The flavors from the lemon, mustards, and herbs was so good in the salmon burgers, but the texture made them incredible. I will now always add yogurt to salmon burgers. The mini size was fun too, but these would have been just as good in a bigger size. I’ll be cooking more from this book during the holidays, and I’ll be re-reading all the tips and options for lots of inspiration. I hope you’re having a fantastic holiday season! Excerpted from Everyday Dorie: The Way I Cook © 2018 by Dorie Greenspan. Photography © 2018 by Ellen Silverman. Reproduced by permission of Rux Martin Books/Houghton Mifflin Harcourt. All rights reserved. When we were shooting the photos for my last book, Dorie’s Cookies, lunch was a highlight of the day, as each of us took turns cooking. 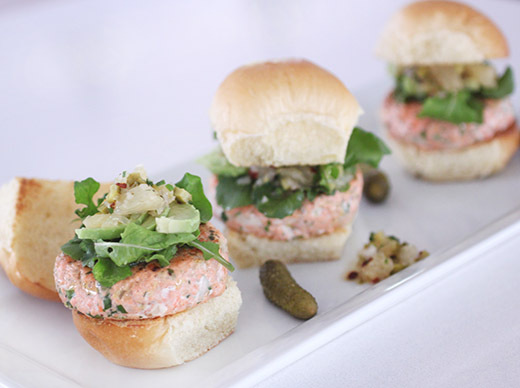 One morning, Claudia Ficca, the food stylist, announced that she’d bought some salmon and had an idea for lunch: salmon burgers. Like everything Claudia does, these are special. They get a supersized helping of zip from lemons, capers, two kinds of mustard, scallions, lots of dill and Greek yogurt, which adds tang and, most important, moisture. You can serve these juicy burgers on buns — I usually put them between Martin’s Potato Rolls, topping them with slices of tomato and avocado, relish or even Quick Pickled Onions (page 320) — and offer them up with coleslaw, cucumber salad or my favorite go-along, Basta Pasta Potato Salad. You can also switch up the herbs — parsley or cilantro can stand in for the dill or be mixed with it — and you can swap the capers for chopped pickles. The blend for the burgers is so packed with flavor that you could even skip the pan-grilling and serve it raw, as tartare. It makes a great starter or, with a green salad and slices of toasted baguette, a main course. 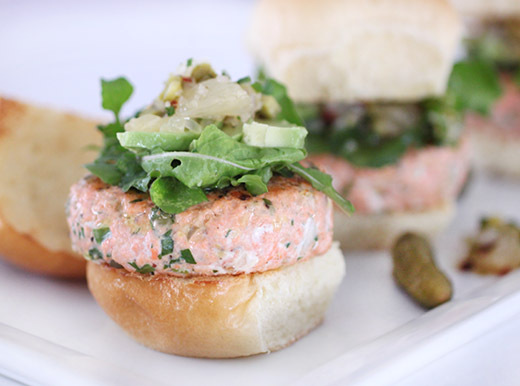 A word on the salmon: My favorite for these burgers is wild Alaskan salmon; sockeye and Chinook are good choices. Because wild salmon is seasonal, I often use frozen fillets. WORKING AHEAD: You can keep the burger mix in the refrigerator for up to 8 hours before cooking. 1. 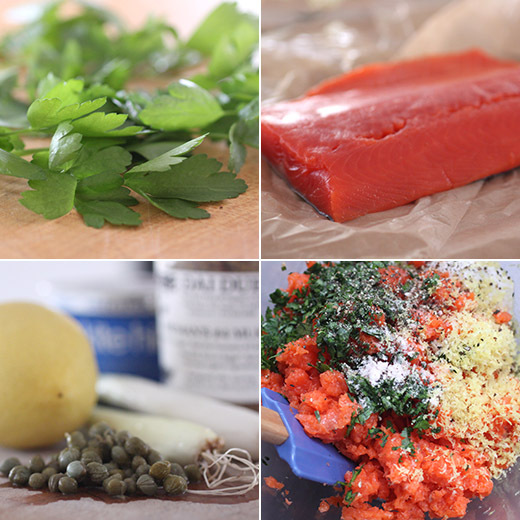 Put the salmon in a food processor and pulse about 6 times, just until it is finely chopped. Stop before you have a paste! 3. When you’re ready to make the burgers, divide the salmon into 6 portions and shape each one into a patty. Lightly coat a grill pan or skillet, preferably nonstick, with a small amount of oil or spray and place it over medium-high heat. Cook the burgers in two batches (don’t crowd the pan) for about 2 minutes on each side — you want to crisp the exterior and just warm the insides. 4. Serve immediately, sandwiching the burgers between the buns and topping them with whatever you choose. STORING: If you have leftover burgers, wrap and refrigerate them for up to 1 day; serve cold on top of a salad or reheat in a microwave. 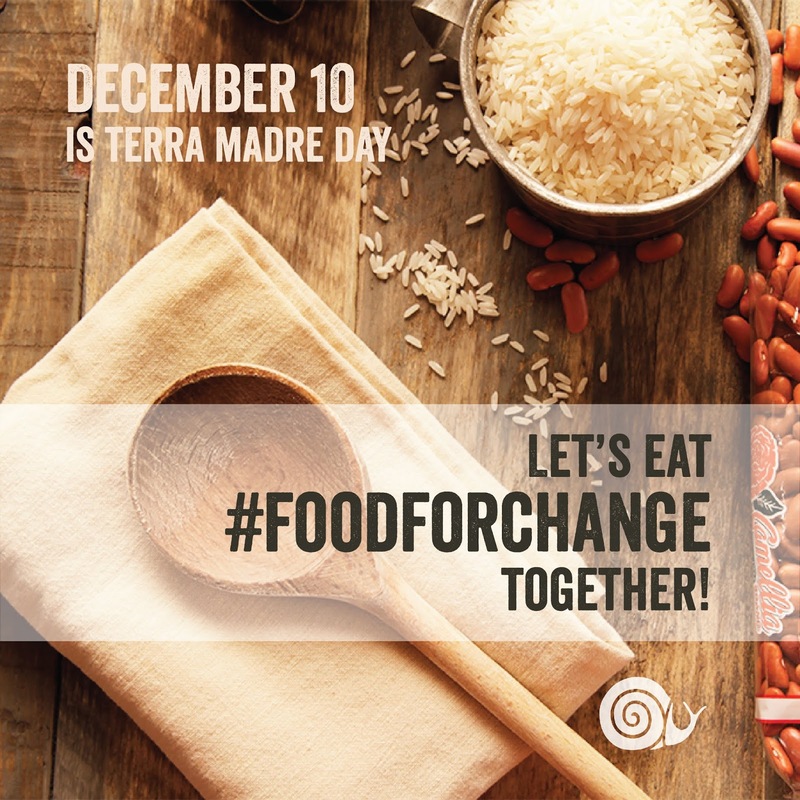 Today is Terra Madre Day. It’s a day for celebrating good, clean, and fair food. 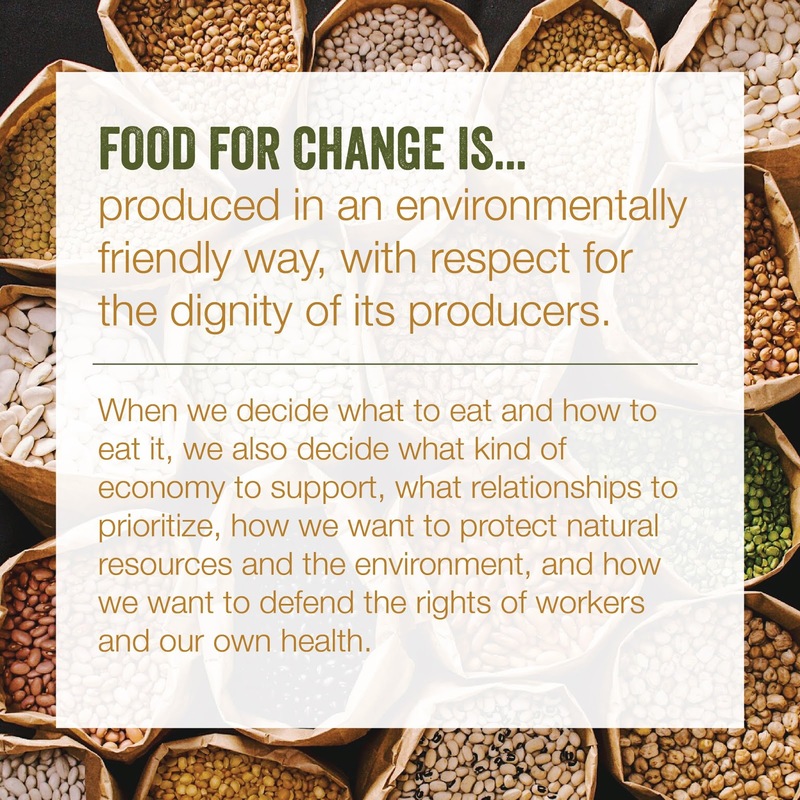 This is a Slow Food celebration that focuses on protecting our environment and on the link between food and climate change. It’s a day to cook Food for Change. And, that can be one delicious way to work toward solving climate change. Full disclosure: I volunteer as the president of the Slow Food Austin chapter. Slow Food partnered with Camellia Beans and Meatless Monday to bring attention to vegetarian cooking for this occasion. After bringing home locally-grown cauliflower, onion, leeks, carrots, and thyme, a hearty soup with those ingredients plus lentils sounded perfect for a chilly night. 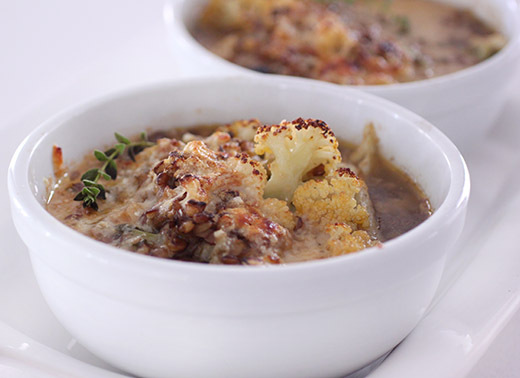 I found this Lentil Soup with Cauliflower and Cheese on the Martha Stewart website. The broiled and browned parmesan on top made it comfort food in a bowl. I hope you’ll consider enjoying some Food for Change and Meatless Mondays or more days! If you have a favorite lentil dish, please share a link in the comments. How do you cook when you’re cooking just for yourself? Do you really cook a whole meal from scratch when it’s just for you? I actually do. One of the reasons I like cooking is because I’m picky. For me, getting to cook just what I want, exactly the way I want, is fun. So, I was already completely on board with the premise of Anita Lo’s latest book Solo: A Modern Cookbook for a Party of One of which I received a review copy. This book is devoted to cooking, and cooking really well, for one. It’s about taking care of yourself and making a great meal to enjoy on your own. And, the dishes have signature Anita Lo flavors with lots of Asian and French influences. There’s a nice focus on not wasting any part of the ingredients you use, and none of the dishes take too long to prepare. Of course, they all scale up easily and can be used to cook for more than one. The Shaved Root Vegetable Salad with Smoked Salmon, Capers, and an Egg sounds delicious and would be bright and colorful with a variety of vegetables jumbled together on the plate. For Fresh Pasta with Anchovies, Charred Lemons and Radish, you’ll spend a bit more time if you make homemade pasta, but the dish is made from pantry ingredients and could be whipped up without much planning. The Thai White Curry with Chicken is an adaptable dish that can be made with other proteins and whatever vegetables are in season. And, there’s a note with this recipe about using the remaining amount of coconut milk in Caramelized Banana with Coconut for dessert. Another waste-reducing dish is the Broccoli Stem Slaw that sounds delicious with an avocado and anchovy paste. I kept marking pages for salads, and one more that I want to try is the Kale Salad with Dates and Tahini Dressing. The complete instructions for this salad are: “Mix everything together. That’s it. Then eat it.” Love that. But, when I saw the Broiled Bluefish, Muffaletta Style recipe, I had to start there. I’m a sucker for a briny olive salad. For this dish, I cooked for two. Luckily, Kurt likes most of the things I like, and this was as easy to make for two as for one. We don’t get bluefish here, so I used black cod instead. The fish was simply broiled, after being brushed with oil and seasoned, skin side up. The olive salad was made with a mix of olives including Kalamata and pimento-stuffed, giardinera, garlic, minced anchovy or anchovy paste, capers, red wine vinegar, olive oil, and fresh oregano. I added some chopped artichoke hearts and skipped the cubed bread. I was happy to use some homegrown oregano since it’s still going strong and threatening to take over my herb garden. Chopped Calabrian chiles are suggested, and I wish I could have found some. I added crushed red chiles instead. The olive salad was mixed and placed in the center of the plate. The broiled fish fillets were placed on top. 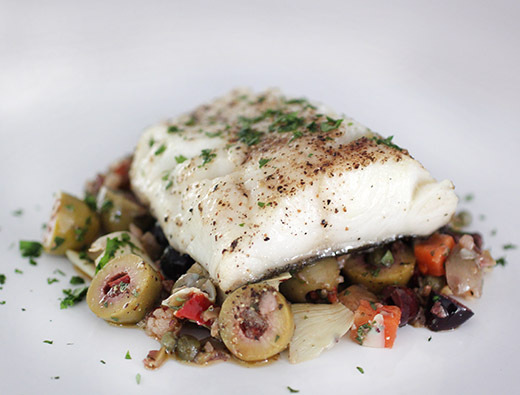 All the assertive flavors in the olive salad paired so well with the flaky fish. I regretted not making extra olive salad to leave in the refrigerator for snacking with crackers or layering into sandwiches. This book offers a lot of great ideas for putting delicious food on the table in smart ways. Whether you’re cooking for one or several, you’ll be treating yourself and others well, cooking your own balanced meals, and keeping waste to a minimum. Preheat your oven or toaster oven to broil. Rub the bluefish with the teaspoon of olive oil on both sides and season both sides with salt and pepper. Place skin side up on an ovenproof tray, close to the heat source, and cook until skin is lightly browned and crisp and the fish is just cooked through, about 5 minutes, depending on thickness. Use a cake tester or thin knife to test doneness—insert it into the thickest part of the filet, hold there for a solid 3 seconds, then test immediately on your lip. If it is warm the touch, the fish is done. 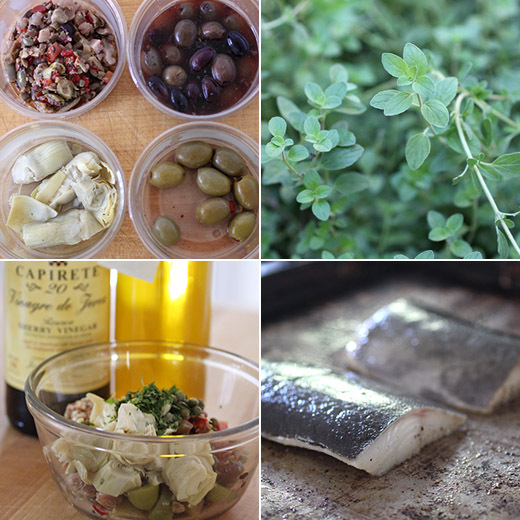 To make the olive salad, mix the ingredients together, taste, and adjust seasonings. 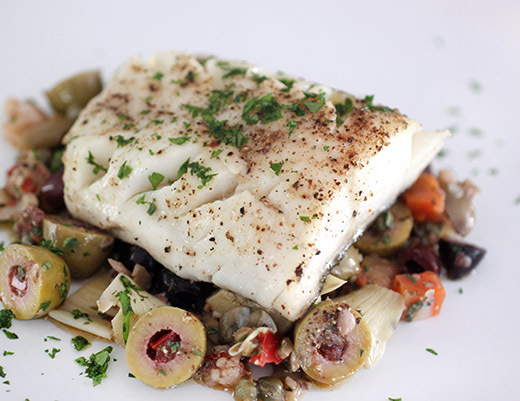 To serve, make a bed of the olive salad and place the fish on top.